Over the years, the number of aquarium accessories has grown in number. You can now get a lot more accessories than before that would make the aquarium better. Such types of accessories include the tetra whisper air pump. With multiple air pumps in various stores, sometimes it could be tough to pick one that works for you. You can now end up with the best one if you get to choose this model. So, what makes it be the best air pump on the market today? We get to check out some of its top features in this review. The construction of an air pump is going to determine just how much vibrations it would make when pumping air. For this model, the manufacturer made it have less vibrations and noise. This is all thanks to the thick motor walls. Such walls would absorb the generated vibration and noise so that they do not reach the air pump. To make it even more silent, the model comes with an additional rubber suspended motor system. We all know that rubber is a good way of keeping the vibrations down. The overall result is that you get an air pump that works properly without generating a lot of noise and vibrations. The manufacturer made sure that people could find the right model for their aquarium. It is the reason the tetra whisper air pumps come in various capacities. You can now pick the one that will work properly depending on the size of aquarium you have. For this model, it is one of the largest. It can handle water up to 100 gallons. This just goes to show that it would work great for larger aquariums you might have. The design of the air pump is always important when it comes to the delivery of good aeration to the aquarium. You always want to end up with a model that delivers the best performance at all times. This is what you get with this model as it is designed to deliver good aeration even for deep water. Having more oxygenated aquarium is great for your fish and other inhabitants in it happy. The pump will deliver oxygen which is essential for your aquarium. It will also help with water movement as a way of improving the water conditions on overall. Other than just delivering the oxygen, the air pump will also provide the underwater bubbles. These bubbles create a mesmerizing touch to the aquarium that you are likely to enjoy. Being a powerful model, it should create more bubbles to make the aquarium look even better. Most people would have a budget in mind before they can even start searching for the best air pump to use. The budget would guide them to pick the best air pump for the money they are willing to spend. You can get the best performance air pump when you get this model. The manufacturer has made it be quite affordable for many people. You will notice that it is cheaper when compared to the various models available today. Even though it is cheap, you do not have to worry about its performance. It is generally the best model you can get for its price. It will still deliver a great performance just like the other top rated air pumps. When it comes to the installation of any machine or device to the aquarium, most people would always be looking for something easy to install and use. The same applies to when you get this type of air pump. The manufacturer made it easy to use there is no doubt about that. You can always use it for your various aquariums with ease. The manufacturer provides detailed instructions on how you can set up the air pump and start using it in no time. For those who might have had problems handlings other air pump models, this could be the easiest that you get today. It should be up and running in no time. Now you have an idea when it comes to picking the best air pump on the market. 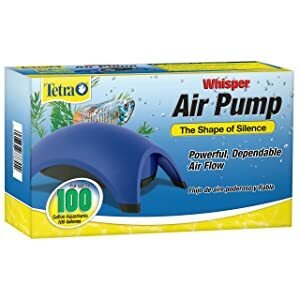 The best about the Tetra Whisper air pump is that it comes with numerous positive reviews. This just goes on to show that it is a reliable model that you could use for your aquarium whenever you want. The affordability and high capacity of the air pump make it one of the best to pick today on the market.